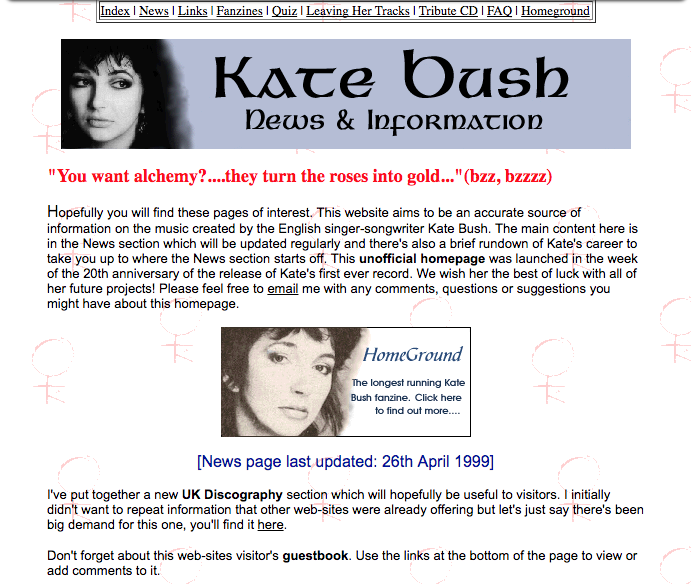 Katebushnews.com is 20 years old today! 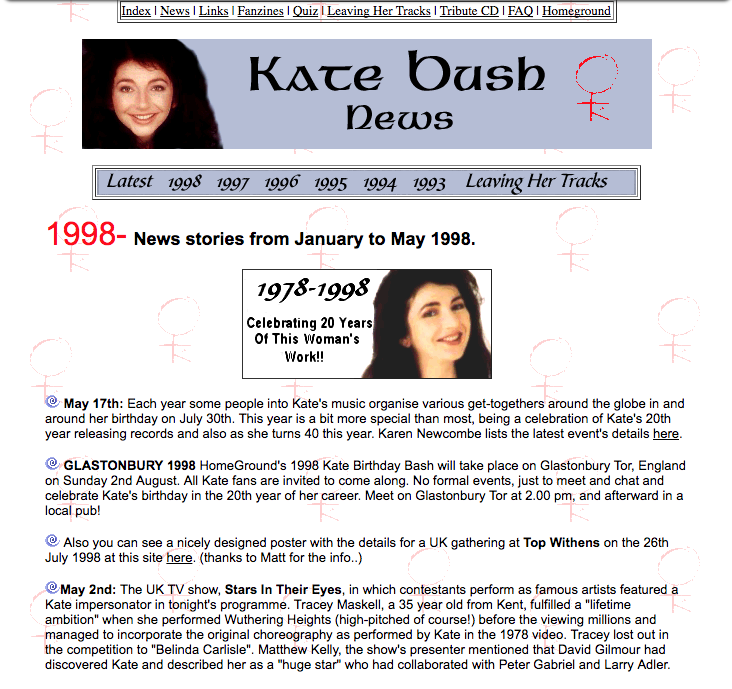 At the risk of everyone getting “anniversary fatigue” what with all the Kate 40th celebrations this year, I thought it was worth marking the fact that on this day, 20 years ago, I launched the Kate Bush News & Information website. On the 25th January 1998 I had no training in HTML or web design or photoshop (could you tell?!!) but I was driven by a need to put something on the web that I felt was sorely lacking at the time – a site that told the world that, despite a 5 year absence (at that point) Kate was still a contemporary and very influential artist and there was still PLENTY of Kate-related news to report and get excited about. Basically…I wanted to make a website that I could browse myself and enjoy (and weirdly I often found myself doing just that!) It was a different online world then – no Google, Facebook, Youtube or Twitter, and it was a lot of hard work gathering news and doing updates without the luxury of things like WordPress – it was a labour of love. Luckily the site rapidly gained in popularity and fans became very generous and helpful informing me of all kinds of news from all over the world. 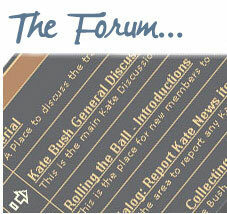 Five years later, in April 2003, I launched the site forum which became a thriving meeting place for all manner of discussion and debate among Kate fans. 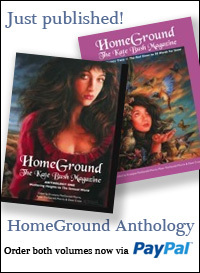 My friends in HomeGround agreed to have their home here on the site and we have enjoyed many exclusive stories and announcements over the years – like when Kate wanted to tell her fans about her son’s birth through the site or when we were the first place anywhere to officially announce the Aerial release after 12 long years between albums! 22 Responses to Katebushnews.com is 20 years old today! Congratulations Sean! It’s been a lot of fun helping out over the years, and it’s been great to watch the website evolve and grow over the years (loving the Podcasts btw). Here’s to 20 more years, you’re a legend! Of course you’re a bit mad! But I for one am intensely grateful that you, along with Krys, Peter and Dave (et al) have continued to be barmy enough to keep this vital resource going over the years, especially when, seemingly, there wasn’t much to report. Well played, sirs, well played! Here’s to many more yet, and assuring you of my continued undying admiration! The impact and influence of the Kate Bush News & Information website cannot be overstated. It will be studied in Academia and bedrooms of music lovers for generations to come. It’s respectful, non-invasive tone towards Kate’s life and work is it’s spectacularly unique hallmark. Seán, you have created something really fantastic for fans and students of Kate’s work and for Kate herself which goes way beyond any type of fan site I have ever seen. Always dignified and scrupulous in its avoidance of gossip, hearsay or speculation. What a gift to both the respected master artist and visitors to the site. As I WANNA BE KATE: The Songs of Kate Bush approaches it’s own 20th anniversary in September of this year, I reflect on how both our creative projects were inspiring and supporting each other on opposite sides of the Atlantic. Kate and her art may be quintessentially British institutions, but Chicago and Dublin have each lifted the banner high of which we can and should both be very proud! Congratulations on the hard earned and well deserved success of the Kate Bush News & Information website! Long may it live to serve those of us who celebrate Kate Bush and her extraordinary work and may you someday be properly and fully acknowledged for your part in keeping all of us patient fans across the globe interested and connected. Your valiant efforts with the site, forum and podcasts have educated, entertained, facilitated immeasurable connections and inspired all of us. Thank you, my dear friend, most humbly and again, congratulations. Thanks for this website esp. from we here in America. In those days before you began the site we really had limited access to news of Kate’s music and the pending release of new albums. It has been especially great to get links from interviews she has given and intelligent reviews that we would otherwise miss here in the United States. What I admire most about Kate is her integrity and respect for her music; she never sold out or let her music become overshadowed by the person or celebrity. We never want to lose that mystique that IS Kate Bush, but without the news your site provides, we would all miss so much that reminds us of her musical genius. Congratulations, Sean!!!! It’s a fantastic resource, I go there to reference (and occasionally reminisce about conversations and people) all the time. I can’t thank you enough, really — you’re like the owner of a favourite old bar that got me through times both good and bad and where I met some wily patrons (also both good and bad). So thank you thank you thank you for keeping your doors open for all this time!!!! Thank you Sean and HG crew for keeping us up to speed on all things Kate for the last two decades. What a wild and fantastic trip it’s been. Here’s to 20 more! I discovered this site about 15 years ago (after having been a Kate fan for about 15 years at the time), and have followed every post since then. I definitely recall hearing about Aerial here first, and the many news roundups you collected – there were so many Kate mentions I wouldn’t have otherwise found, especially here in the U.S. (as Michael E. says above). KBNI has always been primary source of new information about Kate and has provided something to chat or discuss among Kate fans, even when Kate herself is not showing public appearances. What a great accumulation and continuation of your efforts! It’s surprising for me that I have been translating your articles into Japanese for 18 years now. My oldest translation was in year 2000. We can still see the ‘original’ site design. I will keep on translating KBNI to serve the needs of Japanese fans. So, let us keep rollin’ the ball! As a few others have said, it was so difficult in the late ’90s/early 2000s to get any news about Kate in the United States. Your site has been such a blessing all these years. 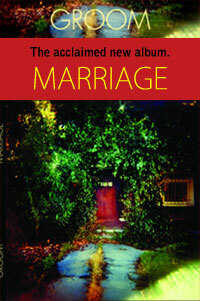 Congratulations and here’s to many more years of Kate’s music and your website. Belated heartfelt congrats! Your endeavors in all things K8-related is clearly one of meaning for many, myself included. That’s great to hear, cheers!